Stuffed bell pepper or bell pepper nihon is an easy to cook recipe that you will hardly find in a restaurant. Blanch bell peppers, stuff them with a filling of your choice, bake for half an hour and serve straight out of the oven. Utensils: A large pot, long-tailed wooden spatula, wire rack, sharp knife, cutting board. Start your recipe by boil rice in salted water until ¾ done. Slice the flesh of the bell peppers one inch from the stem, making a lid. Set aside this slice to de-seed the pepper and remove the white pith. If your bell pepper can stand on its own, it’s very good, otherwise slice a small part from the bottom to make it flat. Boil salted water in a large pot. Add bell peppers to it and submerge them using a long-tailed spatula or cooking spoon. Let the peppers boil in the water for three minutes or until their skin becomes slightly softened. Do not overcook the peppers. Put the peppers in a container containing cold water for a while, before draining them and setting aside. Heat five tablespoons of extra virgin olive oil in a pan and add finely chopped onion to it. Sauté on medium heat and then add garlic paste. Fry until onion and garlic are golden brown. Add meat to it and cook until tender (almost 5 minutes). Meanwhile, season the chicken with salt and pepper. Once done, drain excess oil from the pan. Add chopped bell pepper to the meat. Also stir in ¾ cup of tomatoes (fresh or canned). If you are using canned tomatoes, don’t forget to drain all the liquid. Add boiled rice, paprika, chicken stock and Worcestershire to the mixture and bring it to boil. Cover the pot and allow the filling to simmer on low heat for 15 minutes. Transfer the filling to a medium sized mixing bowl and allow it to cool for 20 minutes. Finally, add egg and parmesan cheese to the mixture and mix well. Stuff the filling into each pepper until it is almost full and cover it with foil. 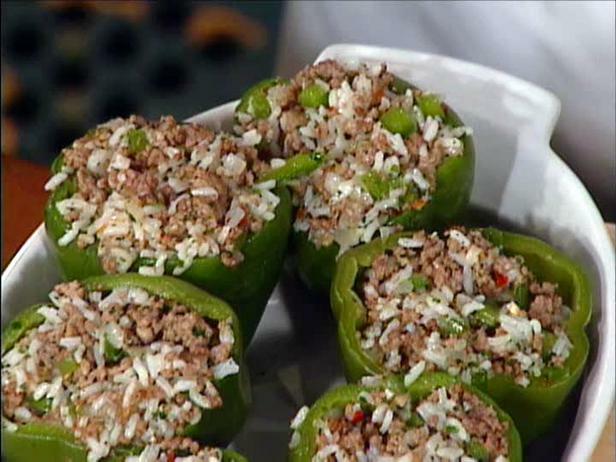 Place the stuffed peppers in a baking dish, pour in some water and bake it for 35 minutes in an oven preheated to 350 degrees Fahrenheit. After 35 minutes, remove the foil and sprinkle cheese onto the baked peppers. Again place it in the oven and bake until the cheese has melted (almost 5 minutes).